Pressure cook lemons till soft say three whistles and 5 mts. Check for the softness, pull apart with fork it should easily tear into pieces. Powder sea salt and red chillies. Add this to the cooked lemon with the juice when it is cold. Keep it in sun for a couple of days. Pickle is all set. This has a good shelf life, it can be refridgerated to extend the life. Use dry spoon everytime. 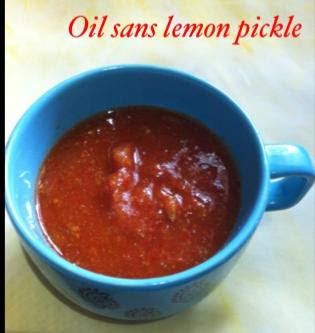 1 Lemon would roughly take 15 to 20 Red chillies and 2 tbsp of sea salt. Check and balance the salt and spice to suit your tastebuds.